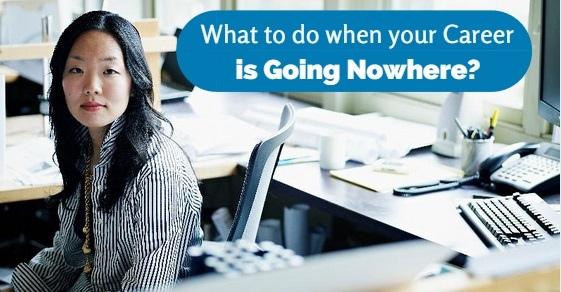 What to do when your Career is Going Nowhere? Do you frequently ask yourself what to do when your career is taking you nowhere? Is it becoming quite stressful and pressured? Some of us are fortunate enough to get a job at an ideal company right after college. These lucky few will climb up the corporate ladder with a combined effort of hard work, positive work environment, progressive learning, and time, whereas the remaining may find themselves stuck in a menial job with a stunted growth. It can be a career dead end unless you change jobs now. If you are at the point of life where no one’s word seems to be helping you, you must opt to take a break. At such time, it would be very much essential to take a short break. This will help you ease your physical as well as your mental exhaustion. This break would be a much needed one to relax and go through your past and glance through on things which could have gone wrong. The break should include a good outing, travelling and even going out of the state for a while. Visiting some close people of your life and taking a visit at your mother’s or father’s can just help you instil that lost confidence. You will also prepare yourself for the future by doing this. However, remember to start off on your second innings only when you have cleared your mind of all cobwebs with a complete clear head. A full commitment would be required from your end as you will have to readjust to a new life. If you have truly given up on career and feel like this mundane routine is only going to suffocate you more then maybe you can opt to take an altogether different course of action. You must try to learn another professional skill, take up some crash course, refresh your dumped language skills, try getting another qualification or even do weekend learning. One can try to do something extra by even spending an hour a day trying to learn more about your niche industry and your job. You can do this either online or by spending some quality time in the local library. Issue a book for yourself and try spending some time on it over the weekend or even on your commute to work. It can help you widen your mind and also get you thinking. Education and new learning is always helpful. It is this learning new “stuff” which will be helpful for you as you get to prove yourself in front of your employees. When your mind is channelized to think better it will obviously reflect on your work output. This is another remedy that is suggested for people. This just helps you go back to what you were before and may be try and find a chord with your good past. Connecting with some old co-workers, bosses or even class-mates allows you to rethink about your career choices and goals. As they had been the constant supervisors of your work output for some time, they will be able to point out at your failure or even say what could be the way out of your misery. You can take their advice and also see and observe of something new which would be happening in their lives. Old contacts can make you take a look at what your goals used to be, what you used to firmly believe and how far you had the perception of going. They can remind you of how you had come –for example you would have been an enthusiastic youngster with big dreams and goals but may be it would have collapsed for some reason. Try and get busy on LinkedIn and try finding those old gems of your life. This does not completely equate to taking a break. This means change your normal daily routine of the day and try initiating new things in it. May be you have been a solid workaholic and refreshment or recreation is something which would have been new for you. At such times, you can join squash, badminton clubs, do zumba or anything else like that. You must actually stop doing what you have always done and say a big bye to your routine. Opt for going to the cinema or to the theatre once in a week. Go camping with your friends and invest in photography. Some therapists say that even starting your day differently may help. Try to take the bus instead of a cab. If it is at a walking distance, take a good walk and look around at the people around. The thought of looking how people struggle to do their daily chores more vehemently than you, can actually infuse energy in you. Your brain needs to be alive, so it needs the perfect new stimuli. Feed it with all of these things and let it grow. This can be a good way to activate your brain if it has also let itself go. If the height of personal frustration and misery has reached its peak, you must try this out. You know that you only live once. For all you know you have spent like 3-5-8 years in the same field and there is nothing new happening. Your boss is unhappy with your work quality, all promotions evade you, foreign posting is something that is unreachable for you and your colleagues are nothing but a dreadful competition- JUST leave the job. Remember you are here to prove nothing to anyone but yourself. What are you going to do dragging yourself in a job when you are not even happy? Do not even resolve to stay for the sake of money- it will put you more down. Can you say this to yourself – I am one of the lucky ones who love doing what I do? It is your life, it is your career and it is your choice. Think well before taking any decision. For guidance you can take a look at EscapeTheCity.org. This may make you a little more enthusiastic about your career even more. 90% of your time of professional career is invested in the office hours. Thus, you should try your best to alleviate your performance in the office itself. If your career is going down it is no one else but you who can help yourself. The best way to resolve it would be to sit down in retrospect and think about possible options. Am I too stiff? Am I only to myself? Do I have a problem in adjustment? Try finding answers by asking yourself – Thus -Be willing to be vulnerable. Be willing to be a little more flexible: Sometimes your career would be going nowhere because you would be having some reservations about yourself . All you can try doing is -Reach out and ask for help which will help you . You should open your mouth to ask your colleagues –How to do a particular task properly? Is there any issue in the way I am handling things? This will help you get open to others and may be they can come and try and help you. Sometimes you will have those qualms for example- asking someone may just lower your prestige, everybody may not help me truly etc. Try to get rid of all these thoughts and let yourself be open to others. Involve yourself with others and then notice the difference of how they will come to help you. Be receptive and listen: It is okay to give your suggestions time and again. It is okay to say that you were receptive and you did learn. But you must also listen very well. The leader in you may say no but you have to shut that up. Your boss would be giving you some suggestions to improve but you would have never acted on it. You may see that he or she has chosen someone else who is not as intelligent as you but is ready to listen to him or her more than what you do. Thus, give up your inhibitions at such times and try taking in other’s opinions. E.g. In group discussions-if you will be trying to act more smarter than your boss, problems could happen. Thus, shut yourself at such times and listen to everybody. They may as well be trying to help you for betterment. Listening to others also involves your criticism. If you feel that they are the people who have always been trying to point out your wrong it is so okay. It is much better than having to feel you are a big zero in the end. Ten fingers pointed at you does not mean you are less- It only brings you to the centre of attraction which gives out the signal that it is the right time to act. You may not be that interactive: A company is a dynamic structure where you need to work with others, help others and get friendly with them to grow. Many discussions would be taking place at such meetings and only because you are too aloof, you would be missing out on what they are planning next. You will have to acknowledge the efforts taking by somebody for your organization as well. You will have to give up the board of ‘I am Simon’ and work hard to prove you are a democratic leader. Take people’s Ideas, insights. Spend time with them. There may be times when you would be sitting at a stretch for a discussion and the points that come may sound useless for you. However you must know that not everyone has the same strength and intellectual capability like others. Thus, you must try working hard in this section. You must surely open your ears to others. Thus, this will make others know you are not just a selfish person but you can be associated with others. This will help you grow in our career. Thus, a motivating and thriving career is not something that can be bought. The only motto would be to try until you succeed, and if you put your heart and soul into it, you can be assured of success. You would have heard that you have to pay your dues for getting success. If these dues involve being compassionate to all, having a fresh outlook and being receptive-it does not seem much of a task to do. It is okay to be weak but bringing that into your profession is a big no. Learn from your mistakes and grow up. A failure is only a beginning.